Though the ingredients for breakfast and the bentos had been prepared, he had forgotten to turn on the stove. He forgot to feed Inko-chan and change his water as well. "... J, just what the hell am I doing, really..."
Ryūji muttered to himself as he looked down towards his feet - the right sock was black while the left was deep blue. It was only when he arrived at the shoe locker by the school entrance to change into his indoor shoes that he discovered this regrettable error. There was nothing he could do now, even though the error was glaringly obvious. The colors are so different, how on earth did I manage to mix them up? But he had no time to think as it was getting late. The dean stood by the stairs ushering the students into their classrooms. Ryūji nodded obligingly, trying not to provoke him. Unfortunately, he did not expect himself to trip as he climbed the stairs, missing the last step and hitting his shin, causing him to squint his strict-looking eyes in pain. For some reason, the lower classmen all shuddered at the sight of that when passing through. As he sighed and rubbed his shin, he thought of one thing - the reason he felt so low was probably because of what happened last night when he parted ways with Aisaka. Ryūji was supposed to feel relieved at being liberated from the troublesome mornings and from having to go through the pain of making an extra bento; he was supposed to have gone back to that comfortable life from before --- but now he was a terrible mess --- I guess this temporarily messed up life won't go back to normal so easily! When he considered that he might have become used to living his life as a dog, he couldn't help but feel pathetic. Yet for some reason, he didn't feel as spirited as before without those yells every morning. He exclaimed and backed off, closing the door along the way. What on earth happened just now? He returned alone to the corridor. Anyway, breathe deeply. Heave... ho... OK, I've calmed down. Lemme think. What did I just see a moment ago? What could have caused this to happen? He couldn't think of an answer no matter how hard he tried, he had to go inside to confirm for himself. Taking a gulp, Ryūji once again put his hand on the door handle, and carefully slid the door open. "... Do I make myself clear?" He felt a deep foreboding voice entering his ear with an intent to kill. Dissenters will be killed without mercy! Determined words that struck down everyone on sight. "If I ever hear anyone saying something useless again... I'll. Definitely. Make. Him. Pay!" Standing in the center of the classroom, with her back towards Ryūji was Aisaka Taiga - also known as the Palmtop Tiger. Surrounding her were a bunch of her classmates struggling to keep their distance from her while hugging the walls, all nodding their heads vigorously. What's going on here? Besides this question, Ryūji could think of nothing else to say, no matter how many times he repeated it... What's going on here?? "... I hope I've made myself clear. I do not like to repeat myself..."
The tiny tiger repeated. "Yessir...!" Everyone, both the guys and girls, replied feebly, shuddering in fear. Upon closer inspection, the desks and chairs around Aisaka were all thrown over, the bags and their various contents were scattered everywhere. The whole classroom looked terrible, resembling a wreckage that just got devastated by a passing typhoon. Though Aisaka's voice was calm, her shoulders trembled exhaustingly, as though she had just yelled loudly. Could she have... No, I can't be wrong, this has to be Aisaka's work. But, why? "...W, what happened? ... What is it?" Why is everyone looking at me with such a weird expression? Though it's a good thing it's not one of contempt, but they look uncomfortable, or is it embarrassed? Anyway, they're all looking at me with such a strange expression. And then Aisaka turned her head as well and silently exchanged glances with him, she didn't even say good morning. Instead, she lifted her chin ambiguously, and simply told the whole class "Dismissed." Their trembling classmates who were huddled together began to return to their seats in groups of twos and threes. One of them came towards Ryūji. "... T, Takasu... I, I'm terribly sorry. It's all because of our strange rumors..."
"I'm so sorry, we'll never imagine such weird things again!" "... Wha? Imagine what? Just what are you trying to say?" "... Hey Takasu,... Now I'm not thinking of anything funny here, I just genuinely think that you're an amazing fellow... and I guess I'm a bit envious as well! I'm so sorry, I'll never think of anything strange ever again!" "J, just hold on a second! What the hell are you talking about? What on earth just happened? This is Aisaka's doing, right? What has she done this time?" "You explain this at once!" Noto's expression looked quite embarrassed, his eyes were shifting everywhere. Noto was one of the few friends not intimidated by Ryūji's eyes, even when being questioned by him. Nevertheless, Ryūji could not let go of Noto's shoulders, he was not letting go until he got an answer... Noto understood this as well, so he responded vaguely, "Well, how should I say this?" "It's like... we kind of eavesdropped... we were spreading gossip about you and the Palmtop Tiger..."
"Well... yeah, gossip about... you two dating each other... 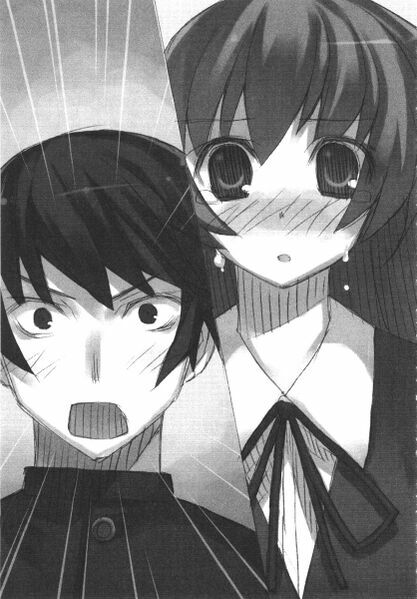 In the end, the Palmtop Tiger went ballistic because of this. She said 'I have no relationship whatsoever with Takasu-kun!' And then all hell began to break loose... That was just too scary, really... This was the first time I actually saw the Palmtop Tiger wreaking havoc. I'll never go against her will again. She then added 'No more nonsense! No more premature conclusions! If anyone dares to spread that gossip around again, I'll kill them! Each and every one of them!' Not even Kushieda could stop her... Right, Kushieda?" Noto called out to Kushieda Minori, who just happened to pass by... Normally, she was supposed to be the only person who knew the Palmtop Tiger well, but now her face lacked it's usual sunshine-like smile. "... Minorin, don't spew any more useless nonsense, or I'll get mad, even at you---"
Aisaka promised forcefully behind her. "Minorin, you must apologize to Takasu-kun as well... Tell him that you know that it was all a misunderstanding yesterday... You must apologize sincerely! This is all thanks to those classmates spreading these rumors... Because I want Minorin of all people to know that this is all a misunderstanding." Aisaka's mouth turned into an inverted-V shape as she became more and more agitated like a child. Her eyes glared straight into Minori without flinching or looking at Ryūji, while her brows were locked in place. "Takasu-kun, I'm sorry I misunderstood you yesterday." "... W, well... t, there's not really... any need to apologize..."
"... It was Taiga that told me to say that. She wanted me to tell you that I know this is all just a misunderstanding. But... I can't believe Taiga would actually do something like this..."
"Whoa?! What the hell's up with this mess?! I can't believe that the order of the classroom has been messed up this badly even though your class-rep was only a little late!" Kitamura arrived with a show of pomposity. Minori swallowed what she was about to say and left Ryūji behind and gave a slap on the back of Aisaka's head, "Don't look so gloomy!" She said, going back to her usual cheery demeanor before returning to her desk. Afterwards, under the instructions of the completely oblivious Kitamura, everyone began to tidy up the messed up desks and tables. "C'mon! Hurry up folks! If Koigakubo sees this, she's gonna be so shocked that she could delay her wedding!" Under Ryūji's gaze, he saw Aisaka walking towards Kitamura. Standing at a very close distance from him, she said something which only he could hear. Kitamura instantly revealed a puzzled expression, before quickly reverting back to his happy-go-lucky smile and nodded to Aisaka. Ryūji saw Aisaka's lips say - I have something to say to you. See you after school. - Or something like that. She said things smoothly this time. She didn't stutter due to nervousness, she didn't even trip, nothing else happened. Aisaka had finally succeeded in calling Kitamura out, and without help from any dog. So ended another day for the seemingly strange Class 2-C. In fact, Ryūji's eyes never left Kitamura and Aisaka. When the hopeless single lady clad in her trendy red dress left the classroom after the class had sent her off at the end of lessons, the classroom became lively once again. There were people rushing off for club activities, people going to meetings, people waiting to go home together, people continuing their conversations from before the end of class - as well as people who exchanged glances and walked out of the classroom together. Without realizing it, Ryūji had left his seat and walked quickly behind Aisaka and Kitamura who just left a while ago. This doesn't feel right, but... After a few seconds of hesitation, But... Though he kept on having doubts, his feet still continued to move forward silently. But, this is Aisaka's moment of truth! And it's not like I don't know how clumsy she is. Maybe she will trip, maybe she will fall down the stairs, maybe she will stutter at the crucial moment, or maybe she will even cry... Since Aisaka's clumsiness is simply spectacular, and only I know about that. The feet that were originally following those two stopped dead in their tracks on the staircase. So, so what? Though I am worried about that clumsy idiot, what else can I do? Help her? But, what for? 'Let us pretend all this never happened, let us go back to where we were before the love letter!' That was what she said herself. If that's the case, I have to erase everything about Aisaka that only I know about from the bottom of my heart. No, instead of thinking about these sad moments, I'd better consider my own current situation! If this clumsy girl fails in confessing her feelings to a guy, how am I supposed to help? Am I supposed to go to her and say 'You all right? I'll protect you!' I mean, how lame can that be? It's not even funny. Ryūji fretted his brow and squinted his fierce eyes, as though a dangerous beam was being fired... though he wasn't mad. I guess I'll head towards the entrance, but not because I want to block any annoying people from passing through, but... Though no one would really understand, that was not the real reason. "... I guess I'll go home!" He forcefully changed directions with his feet and walked away from the two that had left, back towards the classroom. Without anybody noticing, this person seemed to have grown a few centimeters in the past few days. Noto and Haruta, whom Ryūji recently got acquainted with, had invited Ryūji to go somewhere with them, but he turned them down and returned to his desk. Why am I feeling so restless? Why won't I hang out with my friends or go home? I really don't feel like going home now. So instead Ryūji decided he would go kill time in a book store. After walking past someone who had just wiped his hands dry, Ryūji found himself alone in the bathroom, which was eerily quiet, an abnormally strong fragrance of the detergents could be smelt. "... Her expression sure looked scary..."
Is that Palmtop Tiger doing her best right now? For the whole day, whether during lessons or recess, Ryūji was constantly glancing at Aisaka's face. As the end of school approached, every second Aisaka's expression would change considerably. By the end of the last period a while ago, there was no longer any expression on her face - It was neither red nor green, but pale white. Ryūji thought, She's about to confess, so she ought to show a cute face. What a dense fellow. Speaking of dense, he now recalled that commotion this morning, when she wrought havoc upon the classroom, and even frowned at her best friend Minori. It was because it was Minori that she made such a serious expression. That means, she did it for me... It was all done for Ryūji. She did it so that his crush Minori would stop misunderstanding him. It was for this sole purpose that she had created such a ruckus. When you think about it, Aisaka never did the same thing for herself, that is, end Kitamura's misunderstanding of her - namely because Kitamura wasn't around when she went ballistic. As he sighed, the words he wanted to say disappeared as well. Thick, stupid, clumsy way to do it... In the end, Ryūji couldn't say it. Must she really resort to that kind of method for everything? There are probably other, more subtle ways to solve this. To use such a method where she has no gain whatsoever, she's really... gentle to the point of being pathetic. Ryūji genuinely believed that, Aisaka's actually a really gentle girl. Without realizing it, he had used such a laughable adjective to describe the Palmtop Tiger. But he couldn't help it, as it was true. "Gentle..." Ryūji said softly. The one crying and lamenting about how she's no good at being gentle to people was actually the most gentle person of all. Those who never hung out with her would never know, but at least to Ryūji, this was definitely true. A sudden yell caused Ryūji to turn his head in reflex. A schoolmate who had just entered the bathroom simply stood still and yelled in horror. "What's wrong?" Asked the person behind him, before he too exclaimed, "Whoa! I, I'm sorry to disturb you!!!" They were both intimidated by the intense glare that Ryūji had suddenly shot at them. To other people, both Ryūji and the Palmtop Tiger were classified as dangerous - as usual. They're probably gonna announce 'Takasu has occupied the bathroom, stay away from there, it's dangerous' or something like that. This would mean there won't be anyone coming in. Suits me just fine! Since he wasn't in the mood to see anybody, this was just fine for him. Anyway, since nobody's gonna come in for some time, might as well ventilate this place! Ryūji thought, Since the humidity's causing this reek He began to walk towards the window to open it as his obsession for cleanliness got the better of him. He unlocked the handle, pushed opened the window... and then he froze. "Kitamura-kun! I, Kitamura-kun... Kitamura-kun... w... well... umm..."
He could hear Aisaka's voice very loudly and clearly. This men's room was situated on the second floor, below it was the visitor bathroom, and right outside that was the school garden - A space sandwiched between the bathroom window and the row of trees ahead. Feeling incredulous, he slowly stuck his head out to peek, hoping he had heard wrong. Sadly, even that glimmer of hope was dashed. Aisaka and Kitamura were standing right there in that ambiguous spot. Any person with the slightest bit of intelligence would know that whoever uses the bathroom would be able to hear what's being said there! "Seriously... why does she... have to pick right outside the bathroom..."
Ryūji grabbed his head and moaned, and then squatted under the window. Even though no one passes through there - the reason for that is because it sometimes stinks. Without touching the ground with his backside, Ryūji was close to suffocating as he squatted with his head between his knees just like that under the opened window. Aisaka, you really are an idiot! More importantly, what's gonna happen if someone like me were to enter and open the window? Wouldn't they be completely seen?! I don't believe this... So Ryūji decided to stay here for a while. If anyone comes in, I'll just glare at them with these fierce eyes. That was what he planned. Hearing Kitamura's voice, he remained still. "I think I know what you want to say, but I'd look like an idiot if I guessed wrongly, so before I hear you out, I'd like to make sure of something... OK, here goes, are you going out with Takasu?" But he couldn't move. Ryūji seemed to have been tied down by Aisaka's high-pitched nervous voice. "Takasu-kun is, he's... he's, he's... he's..."
There were no words coming out after she repeatedly uttered the word "he's" many times. Idiot! What are you doing?! What're you waiting for?! Hurry up and confess! Or what are you standing outside the bathroom for?! Ryūji screamed inside, while squatting there silently. But Aisaka just couldn't continue. Under such intense silence, she couldn't even utter the word "he's" anymore. At this stage, a normal guy would usually freak out by such intensity and say something like "If that is all, I guess I'll be leaving!" 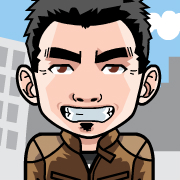 And Kitamura... well, he's busier than your average guy. So if he leaves now, he'll never know about Aisaka's feelings. Hurry up and say it! You have to! Ryūji clenched his fists tightly and gritted his teeth, he even forgot to breathe, and yet Aisaka remained silent. It seemed like this silence would go on and on. Could it have been Mission Impossible since the beginning? She couldn't even call out to him in the classroom normally and now she wants to confess?! That's just too reckless! Is this the end? Ryūji closed his eyes in resignation. "My relationship with Takasu-kun was all a misunderstanding by Minorin! T, the person I really like is..."
Ryūji's legs lost their strength and he nearly ended up falling on his backside. He quickly held onto the wall. Holding his breath and trying not to make any noise, he kept his mouth shut. Eventually, he even covered his mouth with his hands while exclaiming repeatedly in his heart, Way to go, girl! Even though she couldn't even start a conversation with him, even though she was very nervous, Aisaka still managed to confess her feelings to Kitamura. I probably couldn't do the same; if right now I had to go and confess to Minori like how she did it, I don't think I could do it. Although I keep pushing Aisaka to do her best, if I really had to go and confess like she did... I couldn't do it. There's no way I could be as direct as her. As the word "like" was uttered, Ryūji the outsider felt like he had been shot by a shining arrow filled with determination and pureness. The arrow carrying Aisaka's feelings no doubt had been fired into Kitamura's heart as well and into his body. Yes, that's good. With this, feelings will go to where they should belong, and delivered to where they should go. So this sense of dejection must just be my imagination. "You like me...? The thing with Takasu was all a misunderstanding? Did Kushieda get it wrong? She misunderstood you and Takasu?" "... Y, yes. I told her, but Minorin just wouldn't believe me..."
"I see. Then I'm really sorry that I got it wrong. This is because Kushieda can be quite assertive with her thoughts... Yeah, I think I understand now." Kitamura's voice was as calm as usual. Aisaka's was as ambiguous as usual. Ryūji sighed with his hands over his mouth to prevent any sound from coming out. The silence quietly filled the men's bathroom, as he squatted and tried his best not to make a sound, Ryūji felt the silence vibrate around him. Aisaka's voice outside the window once again spoke loudly. "But, I definitely don't hate Takasu-kun at all! Absolutely not! When I was with him, I didn't feel like my breathing had stopped! I always thought I would suffocate every time... but Takasu-kun... Ryūji would even prepare some tasty fried rice for me! Whenever I needed someone to be by my side, only Ryūji was there! He encouraged me even when it meant he had to lie! It's always been like this, that's... what I think! Even now! It feels painful, as though I'm being torn apart, me and Ryūji... no matter when... even now! Because Ryūji was at my side! It's because he was with me that I'm able to be here...!" What are you doing?! WHAT THE HELL ARE YOU DOING?! "I definitely don't hate him. To me, Ryūji... he..."
"It's alright, I think I understand Aisaka's feelings. Anyway... you and Takasu really do get along quite well. Seeing you say that, I feel relieved." "Yeah, and do you remember? It was exactly at this time last year that I confessed to you. I remember saying how I was smitten by your beauty and your directness in expressing your anger, I think." Ryūji was so shocked by this revelation, which he had just heard for the first time, that he came close to tears. Aisaka remained quiet. The only one whose legs were trembling from all the shock was Ryūji, the only one who didn't know anything was Ryūji. "Though I was rejected in the next second." "... Yes, I remember! How could I... forget? It was a strange confession, only Kitamura-kun could have pulled it off. From that point on, every time when you came to our class to find Minorin to discuss club matters, I would always think, 'Ah... that was you...' I remember everything!" "So you do remember! Since you never seemed to notice my existence, I had thought you had forgotten already! I confessed to you back then because I thought you were really beautiful, but when you started to hang out with Takasu, you looked even more captivating... because you would always have such very interesting expressions." "Yup, whenever you were with Takasu, you'd always make some really interesting faces, so I was relieved. Takasu really is a nice guy! And for him to be able to understand a girl like you, I really think that he's amazing." "W, w... WHAT DID I JUST SAY?!" Realizing her blunder, Aisaka screamed. "W, wait a minute... What was I saying? ... And Kitamura-kun, what are you saying?! I already said there's nothing between me and Ryūji, that... eh?! My face looks interesting?! No... Ehh?! No, wait! Wait! Did I just confess?! Did I really just confess?! But... no way! Ehhh?!" "A, a, a, a, all right?! What do you mean all right?! I don't even know what on earth I just said! How can this be all right?!" "I'm very grateful for your feelings, and I'm really happy. I'm sure we'll become good friends from now on." Aisaka was so shaken that she became lost for words. This wasn't exactly the relationship Aisaka was looking for. So Aisaka should respond by saying 'That's not it!' She has to... Ryūji thought. "... Friends... Me and... Kitamura-kun...?" I rejected you after you confessed to me before, but while watching you afterwards, I grew to like you myself. Now I really do like you, and I would like us to go out together as a couple. ... She never properly repeated the most important part of it all. The supposedly ultra self-centered Palmtop Tiger was now trapped by her own claws. "Umm," she uttered, backed down and was finished. "Well then, I'll see you tomorrow!" Kitamura said in his usual carefree style. The good news: his attitude was still the same as usual; the bad news: he had completely no idea what just happened. "... Such a dense girl..."
... Kitamura never really got your message, dammit! That directness of yours that Kitamura talks about, how much of it does he actually know? Your tears, laughter, timidness, loneliness, your love for him... how many of these fragile feelings have you kept hidden? No matter how painful or gentle these feelings are, you never really let him understand them! You never really let him understand you! Getting up on his stiff, cold legs, Ryūji slowly walked out. "Goodbye." Aisaka looked really calm when she said that, though she must have hidden some feelings which no one could understand when she left in solitude. She must be crying in a voice no one can hear while walking with her back towards Kitamura, her tears must be falling down as she walked quaveringly without anyone seeing her... It has to be! Question... What should Takasu Ryūji do now? Though he said it with confidence, even he wasn't so sure. He wasn't answering with his head, but with his heart, skin, bones and flesh, with this body that had spent a lot of time together with Aisaka. Let it move on its own then! If things don't go wrong, then this body will take me to where she is. "... What do you want?" Ryūji finally caught up with Aisaka and grabbed her on the shoulder... They were in a quiet residential alleyway with no one else in sight. "Stop it already... You're no longer my dog, there's no need to follow me anymore!" "Saying that even though you feel like crying. You're feeling depressed because your confession failed, right? Though his response was not quite exactly a rejection." "... Let me put this straight, I didn't mean to eavesdrop on you. It's your fault really, how can you be so stupid as to do your confession just outside the window of the men's room of all places? I just happened to hear the whole thing while going to the bathroom." Under the rays of the sunset, Ryūji could still make out that Aisaka's face was becoming very red as she muttered, "R, really?!" Looks like she really didn't think that out. "Well, what now? Shall we go buy ingredients for dinner tonight? Or do you want to go to last night's family restaurant to commemorate your failed confession? I can listen to you moan about it all night, and it's my treat, but just for today though!" "... W... What, are you talking about?!" Aisaka stood motionless while facing Ryūji, her eyes widened as though she had just seen something incredible. "Come to think of it, there's a sale on pork meat today!" "Or do you want to have beef tonight?" "Not beef either! That's got nothing to do with it, none of it! ... What's wrong with you?! Why?! You're no longer..."
"Or do you want to cook yourself?" "Enough! ... I said... enough! Stop it already! It's all..."
"I'll be by your side." "I'll be by your side, I'll cook for you, you can come to my place to eat as usual, and I'll make bentos for you as well as picking you up every morning, so..."
"So what?! ... What the hell are you doing?!" "What on earth are you talking about?! We'll get misunderstood again! Minorin still doesn't believe us, you'll make her misunderstand you all over again, is that alright with you?" "When that happens, then it'll be my turn to go ballistic! I'll make sure Kitamura's in the classroom and turn the classroom into a war zone just so he won't misunderstand you again." The tears began to trickle down her cheeks. See? Ryūji thought to himself, Aisaka is that sort of person, she would go to a place where no one could see her - except for me - and cry alone. "Why, why... Why would you do such a thing?! Didn't I already say you're no longer my dog?! You don't have to do this anymore!" "... I don't know either, but I just feel like doing it... Since you're crying, I can't leave you alone like that. Because I'll get worried, worried whether you're getting hungry... At least that's what my gentle side thinks." "Nobody's asking you to do this! I'm not a kid, so leave me alone! I don't need you worrying about me!" "... Ahh, so that's why!" Why he wanted to be by her side so much. "It's because I'm not a dog... that's why I'll stay by your side." "Actually, dogs can't really stay by your side!" I'm no dog, a dog could never do that. A dog would come over if it was called, but a tiger would never call out to anyone. Since they never need anybody's help, that's why they're tigers... that's the sort of beast a tiger is. And right here, right now, I am not a dog. "I'm a dragon, and you're a tiger... Since ancient times, the dragon has been the only beast that could stand equal to the tiger. That's why I have to become a dragon, so I can stay by your side." He wasn't called an idiot and he wasn't laughed at either. Standing before him was a girl who couldn't make any sound. She stood with her feet wide apart, her cheeks were soaked wet by tears as she raised her head to look at Ryūji. She looked very angry, and very sad at the same time; she looked a bit fearful, yet also a bit troubled, as well as a bit surprised. At the mention of her name, her body shook as though she was being struck... Aisaka Taiga's eyelids twitched. "This is part of being equal, right? ... Since you call me Ryūji, then I'll call you Taiga." "... What are you trying to pull?!" "What is this conceited nonsense about? Why should I let you call me by my first name?! ... What the hell is this nonsense about being equal?! How shameful! Be aware of where you stand, you idiot Ryūji!" "You probably have no idea what you're talking about! If you really did, how could you have said such insolent stuff? Besides, what the hell is this?! Ahh, I see now, could it be that you..."
After releasing a torrent of abuses, Aisaka suddenly stopped. Just like that, she was the scariest thing imaginable standing there just like that. Her eyes glared venomously towards her opponent while she glided and approached him from below, emitting an aura that would intimidate anyone into paralysis. Those were the true colors of the Palmtop Tiger. "... Don't tell me you've fallen in love with me!" "Hmph, I didn't think so! How could you of all people have the nerve to do something so suicidal?" Yeah that's right. That is so very right. If she had meant my feelings towards Minori, then my feeling towards Aisaka were different, yes they were. But there was one thing that was sure, Ryūji really wanted to take care of that Palmtop Tiger known as Taiga. Even if it has nothing to do with love, I just wanted to be by her side... I must be by her side, that's the sort of person I want to be. That's all. That's all, okay!? There's nothing wrong with that, right?! "... Oh shoot, we need to move! To the supermarket, to buy some pork!" Without hesitating, Ryūji raised his spirits and took off in great strides. Daily life must go on as usual! There's still plenty of time, so let's stop here for now! Now that things have progressed this far, there's no point in thinking complicated thoughts. Our priority for now is dinner! "If we can get some good pork for today, then we can make a hotpot! Ah, perhaps a simple barbecue pork would do as well... And why're you not following?!" Noticing Taiga wasn't following, Ryūji was forced to do a steep U-turn while still walking in big strides and hurried back to her side. "Hurry up already!" He urged, though he didn't grab her by the hand, instead simply poking her elbow with the corner of his bag. "Ryūji...I want to have a yogurt sundae." "Huh?! What the hell, in the end you still wanted to go to a family restaurant? And I was so looking forward to preparing food tonight..."
"We can have pork afterwards... we can have pork with ginger... no, we should have braised pork, the soft and juicy ones!" "Huh? Well, I'm fine with braised pork, but can you eat all of that? It's already five now, dinner in my house always starts at six since time immemorial... Hey, stop ignoring me! And why're you walking ahead of me?!" "... Can you shut up for a bit?" "You should realize how depressed I am right now! How can you not be worried? I'm counting on you for our strategy next time, I still haven't given up on Kitamura-kun, you know? And you, what was that you said? A dragon? Ah well, it doesn't make any difference whether you're a dragon or a dog, but since you said you'll be by my side, then you should work very hard towards my happiness!" Where did those tears just now disappear to? The Palmtop Tiger was still the Palmtop Tiger and with just a few cruel words coupled with contemptuous eyes, Ryūji's heart was dealt a heavy blow. Just how sharp were those claws and fangs? How far will this ferocious, man-eating, Palmtop Tiger be left unopposed? And, what will become of him now that he has declared that he'll stay by her side? "Maybe.......I was a little too hasty..."
Groaning on reflex, Ryūji stopped dead in his tracks. This might have been a mistake. Thinking so, he firmly shut both his eyes. That's why, he couldn't see it. He couldn't see the appearance of Taiga, slightly away from him, smiling with her face down, as she watched Ryūji. He couldn't see the expression on her face as her stifled, ticklish laughter turned into the chuckling of a dove. Today, it still has not been seen by anyone in the world. i like ur blog..very nice.